Kinsey is the definition of modern princess bohemian beauty! 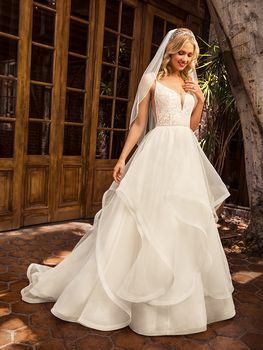 This ballgown wedding dress from Beloved by Casablanca Bridal is swimming in layers of crepe organza, her Chantilly lace bodice delicately framing a plunging neckline. 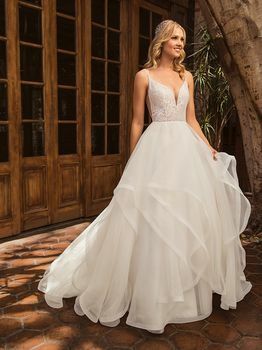 V-shaped cutouts on the side of the bodice mirror the open V-back, which features criss-cross straps.